MOSCOW, July 19. /TASS/. Russia’s Defense Ministry has launched the trials of Poseidon underwater drones at its testing ranges, the ministry’s press office reported on Thursday. "Trials have been organized at the ranges of the Defense Ministry of Russia to confirm the dynamic characteristics of the apparatus [Poseidon] during launches in a real environment and to check the parameters of the apparatus’s movement along the route in autonomous mode," the Defense Ministry said. As of today, comprehensive experimental work on the underwater drone is coming to an end and industrial enterprises have carried out measures for checking the joint operation and the reliability of all the drone’s systems and assemblies, the ministry’s press office said. "Trials have been organized at the ranges of the Defense Ministry of Russia to confirm the dynamic characteristics of the apparatus during launches in a real environment and to check the parameters of the apparatus’s movement along the route in autonomous mode. All the measures for creating the Poseidon system are being carried out in compliance with the work schedule," Russia’s Defense Ministry said. The development of new strategic weapon systems "aims to increase Russia’s defense capability and prevent any aggression against our country and its allies," the Defense Ministry stressed. 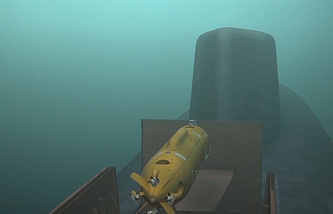 In his state of the nation address to both houses of Russia’s parliament on March 1, Russian President Vladimir Putin mentioned for the first time the country’s efforts to develop a nuclear-powered unmanned underwater vehicle that can carry both conventional and nuclear warheads and is capable of destroying enemy infrastructural facilities, aircraft carrier groups and other targets. 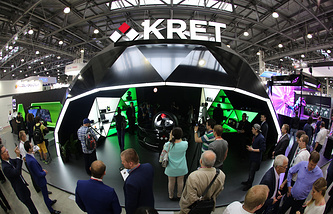 Russian Navy Commander-in-Chief Sergei Korolyov later said that the new weapon system would enable the fleet to accomplish a broad range of missions in waters adjacent to the enemy territory. According to the chief naval commander, the trials of the drone’s basic element, the small-sized nuclear powerplant, have already been carried out. A source in the defense industry earlier told TASS that the Poseidon drone being developed in Russia would be capable of carrying a nuclear warhead with a capacity of up to 2 megatonnes to destroy enemy naval bases. The Poseidon oceanic multipurpose system will be capable of fighting enemy aircraft carriers and hit its coastal facilities at an intercontinental distance, Russia’s Defense Ministry said. "As its main advantage, the Poseidon is actually 100% invulnerable to enemy counter-measures. The drone’s unique capabilities will enable the Russian Navy to fight carrier-led and surface action groups of a potential enemy in any areas of the oceanic theater of operations and strike coastal infrastructure facilities at an intercontinental distance," the ministry said. Russia continues strengthening its military security and the development of new strategic weapon systems is aimed at increasing Russia’s defense potential and preventing any aggression against Russia and its allies, the Defense Ministry stressed. Leading analyst of the group of advisers for the Chief of Russia’s General Staff Igor Kasatonov said "all the measures for creating the Poseidon system are being carried out in compliance with the schedule approved by the defense minister." "Currently, the comprehensive trials of all the elements and systems of the underwater vehicle are coming to a close… The technical parameters of the Poseidon underwater system confirm its invulnerability. This is achieved by a large submersion depth, a high speed and its route of moving towards the target unpredictable for the enemy," Kasatonov stressed. 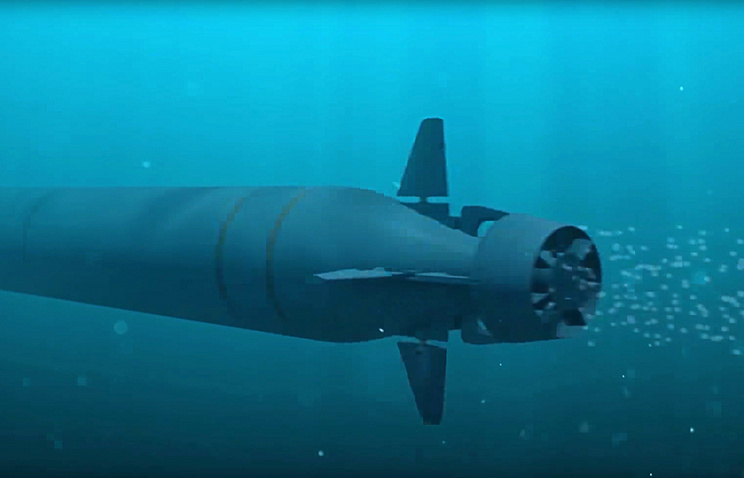 The Poseidon oceanic multipurpose system is a principally new type of seaborne underwater weapons based on the use of drones. As the Russian president stressed in his state of the nation address to both houses of Russia’s parliament, the country had successfully completed in December 2017 the cycle of trials of the nuclear propulsion unit for its installation on the Poseidon underwater drone.